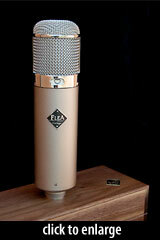 The FLEA 47 is described by the manufacturer as an exact replica of the Neumann U 47 tube condenser. It is a dual-pattern (Cardioid/Omni) tube condenser microphone with historically-accurate capsule and transformer. The “F7” capsule is Flea’s replica of the M7 capsule. The diaphragms on these capsules are installed by former Gefell employee Sigfried Thiersch. Alternatively, the mic is available with a K47-style capsule called the F47/49; this version of the mic is called the Flea Magnum. 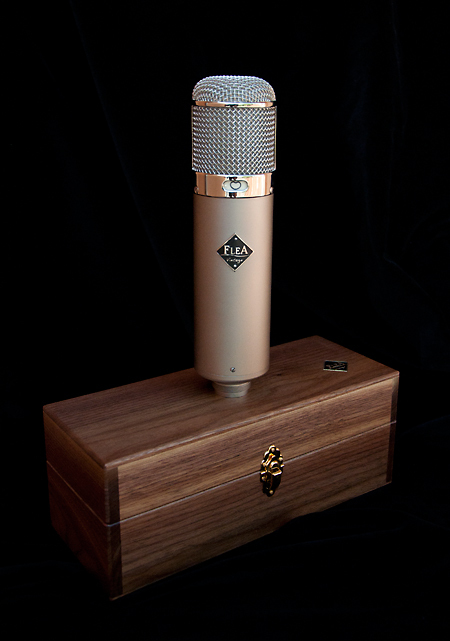 The Flea 47 can be purchased with the customer’s choice of tube: vintage VF14 (the original Neumann steel tube, very rare and expensive); the Telefunken EF14, described as being closest in sound to the VF14; or the UF14. The grille is available in either glossy chrome or matte nickel finishes. Two choices for power supply are available - Modern or vintage style. The “FLEA Magnum” is fitted with the F47/F49 capsule for increase high frequency sensitivity. The mic body is made from nickel-plated duraluminium. The basic Flea47 model ships with EF12 tube, F7 capsule, power supply, and cable. where you need a mic that can be massaged to suit many different singers, the Flea 47 fits the bill nicely, as its lack of obvious coloration makes it easier to shape using EQ. The Flea is also a very practical alternative to an original U47, as these may need a lot of expensive TLC to keep them going. The FLEA 47 is also known as: FLEA Magnum.